"Marines" redirects here. For other uses, see Marine. A marine is a member of an infantry force that specializes in naval operations such as amphibious assault. In some countries, a marine force is often part of a navy, but can also be under army or independent command. Historically, tasks undertaken by marines have included providing protection from war while at sea, reflecting the pressed nature of the ships' company and the risk of mutiny. Other tasks would include boarding of vessels during combat or capture of prize ships and providing manpower for raiding ashore in support of the naval objectives. Marine elements would also contribute to the campaign ashore, in support of the military objective. With the industrialization of warfare in the 20th century the scale of landing operations increased; thus brought with it an increased likelihood of opposition and a need for co-ordination of various military elements. Marine forces evolved to specialize in the skills and capabilities required for amphibious warfare. In the earliest day of naval warfare, there was little distinction between sailors and soldiers on a warship. In ancient China, the first well known naval battles took place during the Warring States (481 BC - 221 BC), a period where regional kings battled against one another. Chinese naval warfare in this ancient period featured grapple-and-hook, as well as ramming tactics with ships called "stomach strikers" and "colliding swoopers". It was written in the subsequent Han Dynasty that the Warring States era Chinese had employed ge chuan ships (dagger-axe ships, or halberd ships), thought to have a simple description of a ship manned by marines carrying dagger-axe halberds as personal weapons to defend their ship . In the west as the oarsmen of Ancient Greek and Roman ships had to be capable of fighting the rowers of opposing ships hand-to-hand; though hoplites began appearing on Greek ships specifically for the boarding of enemy ships. The Roman Navy's two legions, I Adiutrix and II Adiutrix, were among the first distinct naval infantry units. The first organized corps of marines was created when the Spanish King Carlos V first assigned the naval infantry of the Compañías Viejas del Mar de Nápoles (Naples Sea Old Companies) to the Escuadras de Galeras del Mediterráneo (Mediterranean Galley Squadrons) in 1537, progenitors of the current Spanish Navy Marines (Infantería de Marina) corps. The word marine is from the English adjective marine, meaning of the sea, via French marin(e), of the sea from Latin marinus ("maritime"). The word marine was originally used for the forces of England and exact one-word translations for the term do not exist in many other languages except for the Dutch word marinier. Typically, foreign equivalents are called naval infantry or navy infantry or coastal infantry. In French-speaking countries, two phrases exist which could be translated as marine, troupes de marine and fusiliers-marins; similar pseudo-translations exist elsewhere, e.g., Fuzileiros Navais in Portuguese. The word marine/marina means "navy" in many European languages such as Spanish, Dutch, French, Italian, German, Swedish and Norwegian. The principal role of marine troops is military operations in the littoral zone, operating from ships they are trained to land on and secure key points to around 50 miles inland. Marine units primarily deploy from warships using helicopters, landing craft, hovercraft or amphibious vehicles. In addition to their primary role, marine troops are also used in a variety of other naval roles such as ships detachments, small scale raiding, boarding operations, naval vessel & port security, riverine missions, mess duty, and field day operations. Several of the Colonial navies of Australia raised volunteer naval infantry and naval militia brigades in the second half of 19th century. The Victorian Naval Brigade was formed in 1859, the Sydney Naval Brigade in 1864 (later supplemented by the Naval Artillery Volunteers in 1897) and the Queensland Naval Brigade in 1873. Following the Federation of Australia they were combined into the Commonwealth Naval Militia. With the formation of the Royal Australian Navy in 1911 they were renamed the Royal Australian Naval Brigade. At its peak in 1915 it numbered 2,817 officers and men. The Naval Brigade was disbanded in 1920 and volunteers were absorbed into the Royal Australian Naval Reserve. The Bolivian Naval Force includes about 2,000 naval infantry personnel and marines. The Chilean Corps of Naval Infantry (Cuerpo de Infanteria de Marina) is a branch of the Chilean Navy. They specialise in performing amphibious assaults and belong to the Chilean Special Forces Unit, along with the Combat Divers. The Corps is composed of four units, organized along the Chilean territory. Each unit has its own anti-aircraft guns, artillery and landing craft. The Croatian Navy maintains a 200-man naval infantry corps headquartered in Split. The group consists of three companies divided between Pula, Šibenik and Ploče and the 4th Guards Brigade (based at Split), which was transferred to the Croatian Navy as a naval infantry unit in January 2002. The El Salvador Navy included two 600-man Marine Infantry Battalions (Batallon de Infanteria de Marina or BIM), and a 300-man Naval Commando Force. The BIMs were located at La Unión and Usulatan.
) 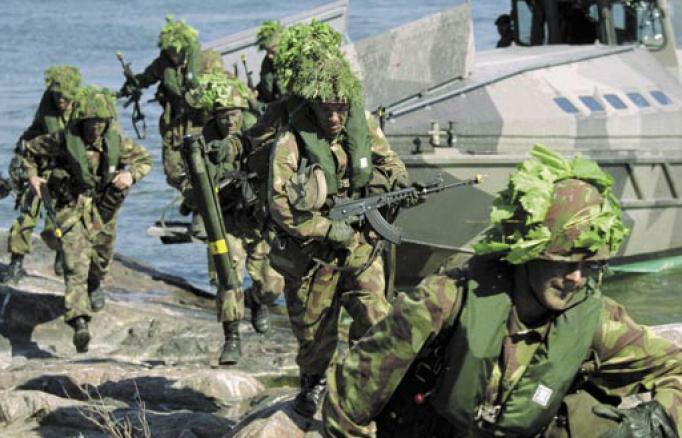 in Ekenäs is a marine infantry unit of the Finnish Navy and trains the Finnish Navy's Coastal Jaegers. The detachment is the only Swedish-speaking unit in the Finnish Defence Forces. The Fusiliers Marins (Naval Fusiliers) are naval personnel. They support operations of the Commandos Marine, protect vessels and installations, strengthen boarding parties and provide military training for the French Navy. Out of their ranks come the naval special forces Commandos Marine (Naval Commandos), a six company Commando formation whose roots can be traced to the Second World War. They have evolved to be broadly comparable to the British Special Boat Service, with whom they exchange officers. Troupes de Marine ("Marine Troops"), are a branch of the French Army renamed from the Troupes Coloniales who served on Frances overseas territories to maintain or expand French interests. Troupes de Marine and the Foreign Legion are the only units of the French Army to have units permanently based in Africa, one regiment in Djibouti, one battalion in Senegal, one battalion in Côte d'Ivoire (until 2009, now forming the core of Operation Unicorn), and one battalion in Gabon; in addition they man bases in the French Overseas Territories. The Troupes de Marine include infantry (Infanterie de Marine), paratroopers, light cavalry and artillery (Artillerie de Marine). They now provide the large ground combat elements of French amphibious task forces and are specifically trained for that purpose. The 9th Marine Brigade (9e Brigade Légère Blindée de Marine (9 BLBMa)) is twinned with the 3 Commando Brigade of the Royal Marines, organising the exchange of officers and sharing training and exercises. The Spezialisierte Einsatzkräfte Marine (Naval Special Deployment Force) is a special operations formation of the German Navy. The battalion includes the Kampfschwimmerkompanie (German commando frogmen), the Minentaucher kompanie and a boarding-company. The unit is based at Eckernförde. The Marineschutzkräfte (Naval Protection Force), is responsible for the protection of naval bases and facilities and can also conduct small scale landings. The battalion is based in Eckernförde and is organized into five units: one staff & support company, three infantry companies and a military intelligence platoon. The Greek 32nd Marine Brigade "Moravas" (32η Ταξιαρχία Πεζοναυτών Mοράβας) and the Amphibious Raider Squadrons (known as MAK) are naval infantry and maritime operations units maintained by the Hellenic Army and supported by the Hellenic Navy. The Indian navy has platoons of amphibious soldiers, similar to US Marines except incorporated as navy instead of a separate corps. The Indian Navy has an elite special operations unit called "MARCOS" (Marine Commandos). They form a special/covert operations and counter-terrorism unit specializing in sea-air-land warfare. Also, they provide support to Indian Army units in specialized areas, such as preventing infiltration in Jammu and Kashmir's Wular lake. This unit was established in 1986, and is reputed to have a strength of 2000 personnel. The Indian Army maintains the 340 Independent Infantry Brigade (Amphibious) subordinate to 12 Corps (Jodhpur, Rajasthan) of the South Western Command. The Indonesian Marine Corps (Korps Marinir) is a corps of the Indonesian Navy (TNI-AL) established on 15 November 1945, comprising two divisions. The Indonesian Marine Corps also maintains a reconnaissance battalion known as Taifib (Batalyon Intai Amfibi). The Indonesian Navy maintains a special operations division known as Denjaka (Detasemen Jala Mengkara) which is employed as a special operations and anti-terror unit. At the fall of the Shah in the Iranian Revolution of 1979, the Imperial Iranian Navy had three battalions of marines. That force has since expanded to 2,600 personnel, two marine brigades each of three marine battalions. These two brigades have also been reported as three marine battalions in the Islamic Republic of Iran Navy (which may be part of the Iranian Army). The Iraqi Navy is a small force with 800 sailors and six platoons of marines designed to protect the shoreline and inland waterways from insurgent infiltration. The navy is also responsible for the security of offshore oil platforms. The navy will have coastal patrol squadrons, assault boat squadrons and a marine battalion. The force will consist of 2,000 to 2,500 sailors by 2010. Shayetet 13 is the elite commando unit of the Israeli Navy. It is tasked with performing special operations at sea, sea-to-land missions, reconnaissance, maritime intelligence gathering, and counter-terrorism operations. Lebanon maintains an elite but very small in number "Navy Commando" regiment. Trained internationally and armed with mostly American and French made equipment, the Lebanese Navy Commandos maintain elite but seldom recognized status as some of the most skilled and well-trained special forces (alongside the Lebanese Maghaweer) in the Levant and Middle East. The San Marco Marine Regiment is the marine infantry unit of the Italian Navy (Marina Militare). The Serenissima Regiment is an amphibious infantry unit of the Italian Army (Esercito Italiano). Its soldiers are called Lagunari. 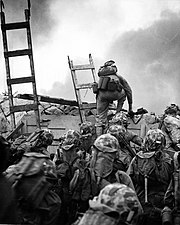 The Republic of Korea Marine Corps is the marine corps of the Republic of Korea. Though theoretically it is under the direction of the Chief of Naval Operations, the Marine Corps operates as a distinct arm of the South Korean forces, unlike most other marine branches, which generally operate as part of the country's navy. It was founded as a reconnaissance force just prior to the start of the Korean War. The ROKMC has seen action in several major conflict. The ROKMC is most famously known for its participation in Vietnam, where it was credited with maintaining better control over its districts than any other country, by US commanders. The ROKMC also maintained a 25:1 kill/death ratio in battle. In one incident, a platoon of ROK Marines wiped out an NVA/VC battalion, alone. The Royal Netherlands Navy naval infantry unit is the Royal Netherlands Marine Corps (Korps Mariniers), founded in 1665 as an infantry regiment to the Dutch Navy. They saw their first amphibious action in 1667 raiding the English coast during the Raid on the Medway. Today, it is a brigade approximately 3500 marines strong, consisting of three marine infantry battalions (one of which is in Aruba and Curaçao), one amphibious combat support battalion and one logistical battalion. The Dutch Marine Corps is an elite light infantry unit, operating as a rapid-reaction force, deployable anywhere in the world within 48 hours. Dutch Marines train in all possible geographical and climate conditions for their role. Enlisted marine recruit training lasts 30 weeks, and marine officers train up to five years (including naval academy time). It has its own Special Forces branch known as Maritime Special Operations Forces (MARSOF); including a smaller elite Counter Terrorism (CT) unit: the ‘Unit Interventie Mariniers’ (UIM) of roughly 130 operators. The UIM is the Netherlands main counter terrorism unit and upholds a reputation as one of the best of its kind, globally. Pakistani and U.S. Marines come ashore during a training exercise. The Pakistan Marines division of the Pakistan Navy was re-established on April 14, 1990, with about 2000 men and plans to expand the force significantly by 2015. The marines are based at PNS Qasim naval base. The Pakistan Marine Corps assisted in the recovery efforts following the country's floods in 2010. The Portuguese Corpo de Fuzileiros; the world's second oldest marine force. The second oldest marine corps in the world was founded as the Terço of the Navy of the Crown of Portugal in 1618. The Portuguese Navy still maintains this naval infantry corps, which is currently known as the Corpo de Fuzileiros. The Portuguese Marine Corps consists of about 1500 men, including two naval infantry battalions, a naval police unit, a special operations unit and several support units (logistical, fire support, landing craft, etc.). The Russian Navy also has the Russian commando frogmen, an elite unit of underwater reconnaissance. The Saudi Navy maintains two 1500-man marine brigades consisting of three battalions each. The brigades are assigned to the Western Fleet headquartered in Jeddah and the Eastern Fleet headquartered in Jubail. The brigades are equipped with 200 Pegaso BMR AFVs and HMMWVs. The South African Navy's new Rapid Reaction Squadron is a marine type unit. It is planned that this squadron will eventually be a battalion sized unit. Currently it consists of four companies. Members are sailors and use naval ranks. They are trained in infantry combat up to company sized operations. They are also used for crowd control and conduct peacekeeping operations. During peacekeeping operations they are meant to augment an army infantry battalion. Their role is very similar to the now disbanded South Africa Marine Corps. The Spanish Navy Marines (Infantería de Marina) are the oldest existing marine force in the world, as they were established on February 27, 1537, by Charles I when he permanently assigned the Compañías Viejas del Mar de Nápoles (Naples Sea Old Companies) to the Escuadras de Galeras del Mediterráneo (Mediterranean Galley Squadrons). Their red trouser stripes mark the Infanteria de Marina as part of the Royal Household Corps, an honor only shared with the Royal Guard, and were given by Charles III to the marines in reward for their fierce defence of the Castillo del Morro in Havana against the British fleet in 1763. Naval Patrolmen are naval infantry units of the Sri Lanka Navy. It may be 2-3 battalions strong. These units were formed primary as a protective force for base and port security, but has since been trained and deployed for amphibious and land combat operations. In addition to being equipped with light arms, the patrolmen have 60mm, 82mm mortars and operate Unibuffel light armored vehicles. British Royal Marines disembark from their Rigid Raider landing craft onto a beach during an exercise. The United States Marine Corps (USMC) is currently the largest marine force in the world, responsible for almost all of the United States of America's expeditionary operations. Created in 1775, they were originally intended only to guard naval vessels during the American Revolutionary War. While the USMC is a component part of the Department of the Navy in the military command structure, it is a military branch completely separate from the United States Navy. Indeed when the navy was first established the USMC was used to train the Navy's untrained sailors. The USMC also provides marines as security guards at U.S. diplomatic posts throughout the world. They also provide helicopter transportation for the President of the United States aboard Marine One. Their motto is Semper Fidelis, which means "always faithful" in Latin. The Confederate States Marine Corps (CSMC), a branch of the Confederate States Navy, was established by the Confederate Congress on 16 March 1861 and were mainly (80%) defectors from the U.S. Marines. German Empire: During the German Imperial era, three ‘sea battalions’ or Seebataillone based at Kiel, Wilhelmshaven and Tsingtao were maintained. These units served intermittently as colonial intervention forces. The III Seebataillon at the imperial navy’s east Asian station at Tsingtao was the only all-German unit with permanent status in a protectorate/colony. The battalion fought at the Siege of Tsingtao. During feudal Japan the Japanese also used Ashigaru soldier or regular Yumi archer as soldier to protect ships from pirates. Both the Imperial Japanese Navy and Imperial Japanese Army maintained marine-type units. Both were dissolved at the end of World War II and Japan does not currently have marines as such. ↑ Lendering, Jona. "Legio I Adiutrix". Livius.org. http://www.livius.org/le-lh/legio/i_adiutrix.html. Retrieved 7 February 2010. ↑ Lendering, Jona. "Legio II Adiutrix". Livius.org. http://www.livius.org/le-lh/legio/ii_adiutrix.html. Retrieved 7 February 2010. ↑ "Historia de La Infanteria de Marina" (in Spanish language). Spanish Navy Marines. http://www.revistanaval.com/infanteriademarina/historia.htm. Retrieved 7 February 2010. ↑ "Specialist force trained for East Timor-style operations". Herald Sun. 12 December 2012. http://www.heraldsun.com.au/news/more-news/specialist-force-trained-for-east-timor-style-operations/story-fn7x8me2-1226175610489. ↑ "Royal Marines Recruit Training". Secretary of State for Defence. http://www.royalmarines.mod.uk/server/show/nav.6878. Retrieved 14 November 2008. ↑ "Royal Marines Officer Training". Secretary of State for Defence. http://www.royalmarines.mod.uk/server/show/nav.6886. Retrieved 14 November 2008. ↑ United States Department of the Navy. "Expeditionary Operations" (PDF). United States Government. pp. 35. http://www.marines.mil/news/publications/Documents/MCDP%203%20Expeditionary%20Operations.pdf. Retrieved 14 November 2008. ↑ "Birth of Marines". Recruit Knowledge. MCRD Museum Historical Society. Archived from the original on 2006-05-23. http://web.archive.org/web/20060523134506/http://www.recruitknowledge.com/pages/history/mch1.htm. Retrieved 2006-02-03.